It’s late on a lazy Sunday afternoon. I made New York Sours, a variation on the classic Whiskey Sour, for a friend who’s fond of them last evening. The Whiskey Sour is itself one of a family of drinks made according to an in-common recipe. I’m intrigued by the classic version of this cocktail, and put together an example. At right is a result of today’s experimentation. Sours are generally proportioned three parts spirit, two parts lemon or lime juice (the sour) as appropriate, and one part simple syrup. Adjust to taste; balance is key. A refinement of the basic recipe equalizes lemon and simple syrup. Update: a 3-1-1 Whiskey Sour is a notch better; sweet neatly balances sour pucker, and lemon neatly cuts alcohol, leaving overtones of whiskey flavor and lemon fruit. A proper margarita is a typical example: three parts tequila, two of lime juice and orange liqueur, and one of simple syrup. Lemon works better with some spirits, lime with others. I wrote about another classic sour, here. For today’s fun, I wanted no more than three ounces of liquor in each drink so I made my “parts” one ounce. 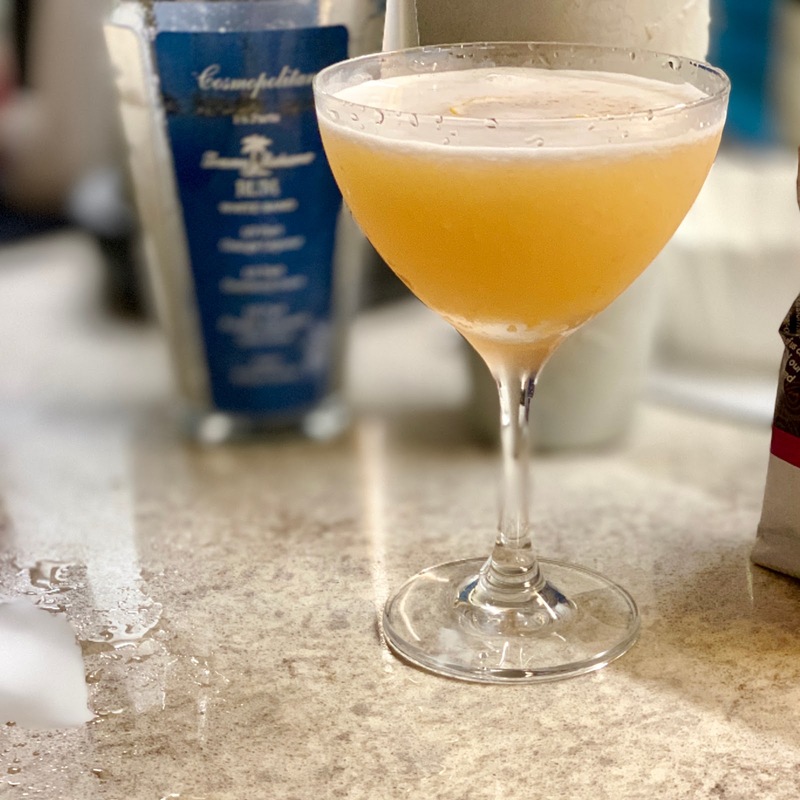 That gave my Whiskey Sour three ounces of Four Roses bourbon, two ounces of freshly squeezed lemon juice, and an ounce of simple syrup, neatly filling my throwback coupe after shaking. For a larger drink, use 1.5 ounces per part. Traditional recipes include an optional one part egg white for froth. I went that route for my Whiskey Sour, dry-shaking all of the ingredients for ten seconds or so to fully incorporate the egg white with the other liquids before opening the shaker, adding ice, and re-shaking as with any non-egg white cocktail. I could have just shaken everything longer with ice at the peril of over-diluting it. If a cocktail contains only spirits, stir it. If a cocktail contains juice, dairy, or egg white, shake. The result was delicious, a slice of cocktail history in a chilled coupe, garnished with a pigtail of lemon rind. I made an Amaretto Sour for Kelly, substituting amaretto for whiskey. It was equally enjoyed; a sweeter, almond-flavored version of mine. These cocktails were easy to make with just a bit of planning. A Friday stop at the grocer for fresh lemons and a half-hour spent combining equal parts boiled water and sugar before cooling into simple syrup allows for a ten-minute, start-to-finish cocktail preparation when you’re ready to enjoy. A shaker and glasses complete the required equipment. Give these classics a try.